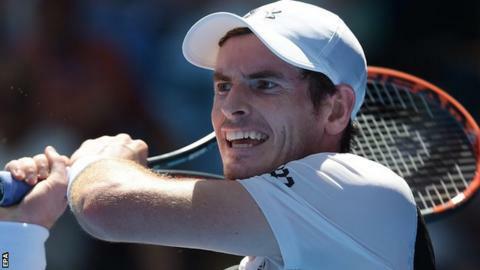 British number one Andy Murray says he will be "ready" for big-serving Australian Sam Groth as he bids to progress to the third round of the Australian Open. Groth, 28, who has the fastest serve in world tennis, faces Murray in the early hours of Thursday morning. "I'll need to return well and pass well if I want to win," Murray said. Compatriot Johanna Konta, the world number 47, beat China's Zheng Saisai 6-2 6-3 in round two. The British number one, 24, is making her Australian Open main draw debut and knocked out eighth seed Venus Williams in the opening round. Groth, ranked 67th in the world, has twice given up tennis to play Aussie Rules football, first as a 16-year-old and then the second time more seriously, when he joined Melbourne side Vermont Eagles in 2011. Returning to tennis in 2012, he shot the world's fastest recorded serve of 163mph and last year enjoyed an impressive season, achieving his best performance at each of the four Grand Slams. "He'll obviously have the crowd behind him," Murray said. "He's a very competitive guy so he fights extremely hard, he has a great attitude. "He'll make it tough for me because he has a different game style to a lot of the players now. "It's my first time playing him in singles, he's a big guy. He serves big and uses serve-and-volley tactics." The 28-year-old beat Frenchman Adrian Mannarino in four sets to set up the meeting with second seed Murray. Groth and compatriot Lleyton Hewitt were beaten by Murray and brother Jamie in a five-set Davis Cup semi-final in Glasgow last September. Fed Cup captain Judy Murray will be keeping a close eye on the all-British encounter in the second round of the women's doubles. Britain's number one and two in singles, Jo Konta and Heather Watson, face compatriots Jocelyn Rae and Anna Smith, who defeated China's Chen Liang and Shuai Peng 3-6 6-2 7-6 (7-2). All four players are in Murray's squad to travel to Israel for the gruelling Euro-Africa Zone tournament straight after Melbourne. Will Melbourne belong to Murray? Read more on Will Andy Murray finally capture the Australian Open title?